Merry Xmas from Play'n GO is a Christmas-themed slot that invites you to enjoy the festive atmosphere while getting the chance of winning some money. The symbols are beautifully drawn and show Christmas items, as well as Santa and a reindeer, and the cheerful music is also a good fit for this theme and will probably lift your spirit and put you in a nice holiday mood. What makes this game interesting are the multiplier wild symbols and the pick and click bonus game. The variance of the slot is medium to high, and it is best played for a little while. Although you can win decent amounts in the bonus game or the base game, the highest money is won with the multiplier wild symbols, but getting a decent combination can take some time. The theoretical return to player is 95.79%, which is average for an online slot. 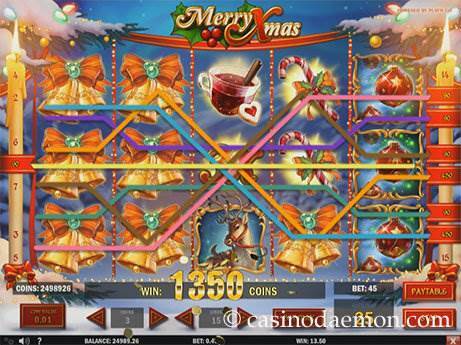 You can also play Merry Xmas mobile, as the game is available for many different devices and optimised for mobile casinos. 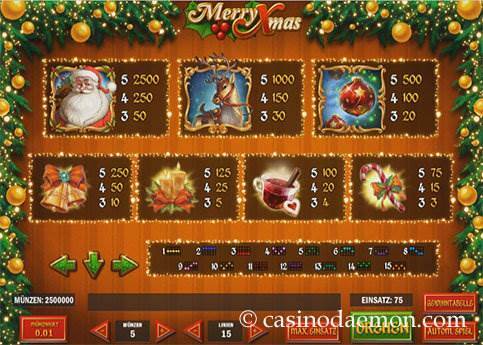 You can play Merry Xmas for free on this page and try the demo version of the game without any risk of losing money. If you want to play the game for real money you can find it at one of the online casinos mentioned on this page. The probably most interesting symbol in this game is the wild symbol, which will basically just show a number of between 2 and 5, and stand-in for other symbols to create winning combinations. The number corresponds to the multiplier of the symbol, and every win that you achieve with the corresponding wild symbol will be multiplied according to the number. The bonus game is triggered with three gift boxes anywhere on the screen. 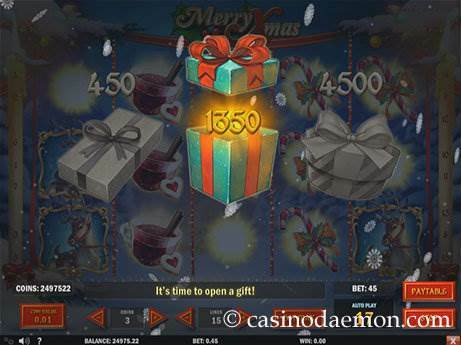 You can then pick one of the gifts and reveal a gift of up to 150x your total bet. You can also gamble your winnings and get the chance to either double or quadruple them. Guess the correct card colour for a 50% chance of doubling your winnings, or guess the correct card suit for a 25% chance of quadrupling the amount. 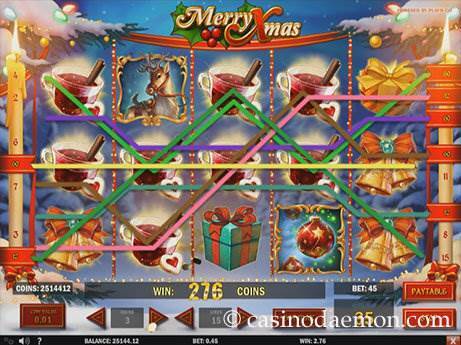 The Merry Xmas slot has 5 reels with 15 variable pay-lines, and you can select coin values between 0.01 and 0.25 £/$/€. The minimum you have to play in one round is 0.01 £/$/€ for one activated line, 0.15 £/$/€ for all activated lines and you can play up to 18.75 £/$/€ in one round. Automatic play is also possible.